Explore Mississauga's public art, museums, heritage, artists, venues, events and other cultural resources. Welcome to the City of Mississauga's mapping site. 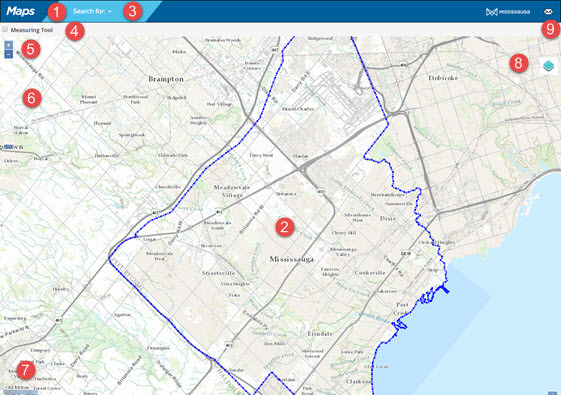 Mississauga Maps is supported on all major browsers, including Google Chrome, Internet Explorer, Firefox and Safari. Use the latest version of your favourite browser to get the best experience. Older browser versions, or other browsers not listed, may not work as well. 1 Map Page Header Top section of the page with the search control and social media links. The Maps logo can be clicked on to reset the map back to the original zoom. 2 Map Viewer Window The Map Viewer window is for viewing and interacting with mapping data. 3 Search The Search menu is to locate Street addresses, Intersections and City Points of Interest. See below for more details. 4 Measuring Tool Select the check box to measure approximate length or area. See below for more details. 5 Zoom In and Out Buttons Can be clicked on to zoom the map for more or less detail; the closer you zoom in, you will see more detail and a smaller area. 6 . Zoom Level Control The Zoom Level Control displays your current zoom level and it can be clicked on for quick changes to the zoom. 7 Scale Bar The Scale Bar displays the relationship of distances on the Map with those on the ground. The Scale Bar changes each time you zoom IN, zoom OUT, or resize the Map Viewer window's zoom scale. 8 Map Layer Picker Mouse over the blue stacked diamond to show the Layer Picker, which displays what additional details can be added or removed. The levels displayed are dynamically shown based on the zoom. 9 Feedback Link Click here to submit any feedback, including data and functionality issues, thank you. Who do I contact in case I have problems with the Mississauga Maps Site? - send an email to maps.feedback@mississauga.ca if you have any issues with the Mississauga Maps site.